Today we are participating in a meme that our good friend Yogi is hosting called Skywatch Friday. It's pretty simple, really. You just post a picture of the sky in your area of the world and share it with the others. The trick of it all is that they post on Thursday afternoons. Those tricky tricksters. I've seen Yogi's posts for a long time now, but today was the first time I checked out some of the others. Apparently, I have been missing out. There are posts from all over the world. I could lose myself for hours. If you tend to take pictures of funky clouds or beautiful sunrises and sunsets - this is the meme for you! Anyone who knows me even a little is probably aware of the fact that I truly hate getting up in the morning. When my alarm goes off at 6a on the weekdays I have to force myself into motion and begrudgingly begin my day. As a way to stick my tongue out and nanny-nanny-boo-boo the weekdays, I stay in bed on Saturdays long after I wake up. So there, Monday - in your face! My neighbor and I take turns driving our teenage boys to the bus stop in the early morning hours and sit in the car with them until it arrives. Waiting in the cold at the bus stop is one of my least favorite childhood memories, so I took that one out of the running for my kiddos. During these treks, I see some beautiful sunrises. These sunrises make getting up so early a little more bearable. I'm still going to tell that I wouldn't get up in the morning just to see one. I'm stubborn like that. 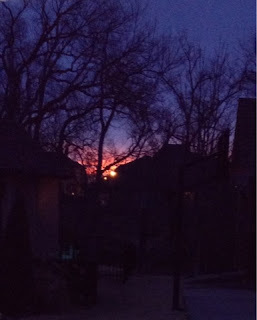 My picture today is from last week when I was driving home from the bus stop. It's iPhonography at its best! You know... fuzzy. It still shows you the beautiful colors peeking through the trees and houses. I prefer my sunsets to be peeking through trees. It shows off the intricacies of the trees with their branches with a spotlight! I'm hoping you will participate in Skywatch Friday with us! All you need to know is on their website HERE and their Facebook page. Be sure to pop over and tell Yogi a big hello in the comments! We will be linking up our post this afternoon. Will you?